Sildi is at present seven years old. He is doing well and is in good health. Sildi attends the first grade at school and is doing well with the lessons. His favorite subject in his class is ABC. Sildi likes to be a policeman when he grows up, so he can be close to the people who need him to protect them from harm. He and his other friends love to play for a long while during the afternoons, especially during spring, as the days get longer and warmer. Sildi’s favorite color is blue. Sildi attends every Monday and Thursday our feeding programme at Rodokal. Sildi comes with his friends, right after he gets out from the school. In order for them to attend, they have to walk for about forty minutes therefore they gather in groups to do this walk altogether. On Mondays the cooks are serving to the children pasta, sausages and fruits. On Thursdays the cooks serve chicken, rice and fruits. The food is cooked in our base at Pogradec and transported to the villages. Sildi and his friends enjoy these meals and attend the Bible classes. The teachers are leading the class to a time of singing and are teaching them by using Bible stories. At the end of each Bible lesson the children spend a while playing outside or in rainy days they draw and color inside our feeding centers. Sildi same as all the children who attend the feeding programmes gains a free dental care once a year, offered at our dental clinic in Kotodesh. Sildi’s family is contained by six persons. Their home has three rooms, which are not offering appropriated living conditions to them. He has his father, mother, and three brothers. Their names are Arberi, Afrim and Vasil. Arberi and Afrim are twins. They are fifteen years old. During this year they left our feeding programme as they are working part time to help the family. Arberi is attending the ninth grade at school. Afrim completed the ninth grade. 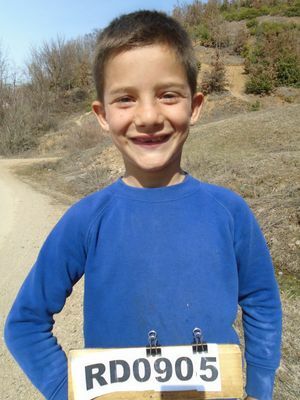 Vasil is nine years old and is attending the third grade at school. Vasil is also frequenting our programme. Sildi’s father is working in Macedonia for the at least eight months each year. He is hired to work in a car wash. The family owns land, same as all who live in Rodokal. They have planted wheat as the mother bakes the bread at home and wheat is also a stock food provision to the animals. The family owns two donkeys and a mule. Afrim and Arbri go to collect fire-wood in the nearest mountain. The firewood is of high cost and they can’t offer to buy it. The mother is able to plant a vegetable garden in the land that is close to their home in order to gain fresh vegetables such as tomatoes, anions, peppers, beans, etc. The father is earning too less by his job in emigration and is not able to provide what is needed the most for the family. He is also working for four months in the village on his land, but what he gains is even less. This family is a big one therefore they are living in poverty, even that they have products from the fields. The team visited the family and received this information for Sildi and spoke with his older brothers. They are already saved as they used to attend our programme.